A WOMAN'S Gumtree post has gone viral just days after she posted it online. 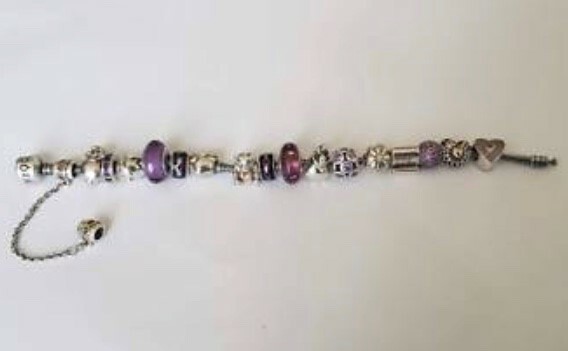 The post is equal parts humourous and sad, because she lists off the beads on the Pandora bracelet for sale as she describes her husband's unfaithfulness. 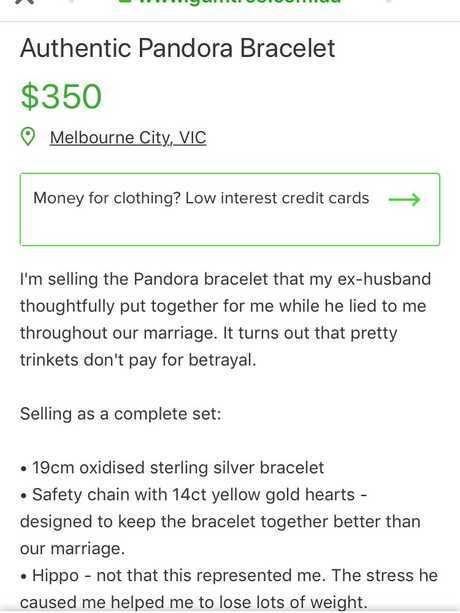 "Im selling the Pandora bracelet that my ex-husband thoughtfully put together for me while he lied throughout our marriage," the listing reads. "It turns out that pretty trinkets don't pay for betrayal." The woman then lists off the set - noting the 19cm sterling silver bracelet and the safety chain with yellow gold hearts "designed to keep the bracelet together better than our marriage". A screenshot of the woman's viral Gumtree ad. "Hippo. Not that this represented me. The stress he caused me helped me to lose lots of weight". She then goes on to list the amethyst spacer and the chick charm "like the babies he was trying to force me to have because he wanted babies before he was 30 and wouldn't entertain the discussion about what I wanted". She lists off more of the bracelet's features including a yellow gold heart with an arrow "symbolising the pain in my heart when I found out how long they'd been going on for". Then there's the limited edition teddy bear "much like the limited nature of his trustworthiness". There's also a charm of a bride and groom dancing "not that we ever danced, he hated dancing but I loved it," she said. She assures potential buyers the pieces are "all in very good condition (much like I am now after the divorce)". She asks for a PayPal payment or cash as "apparently tears of my enemy is not a legitimate payment type".